At its simplest, advisory boards are groups of subject matter experts providing a company's leadership team with guidance on company vision, innovation, risk management, and profitability. A 2014 Canadian study by the Business Development Bank of Canada polled over 1,000 small and medium-sized enterprises (SMEs) to reveal that only 6% of SMEs have access to an advisory board, yet 80% indicated that they'd set up an advisory board again. In large corporations, the annual compensation paid to advisory board members is normally between a third and half of what's paid to regular board directors. 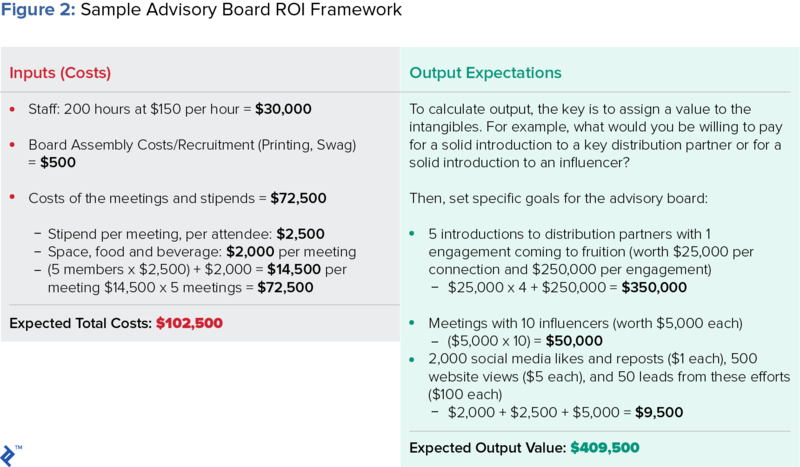 There is anecdotal evidence of ROI for advisory boards (returns of over $100 million for large companies to higher evaluations for startups), but it's difficult to pin down representative statistics. There's a specific objective and internal resources are not equipped to execute. A company with specific needs such as making an acquisition, selling the company, entering a new market, or raising capital can benefit from an advisory board. The company would benefit from positive association. Advisors typically have impressive track records that corporations want to affiliate with. When a company showcases its advisors, it demonstrates that it's surrounding itself with key opinion leaders and that these leaders are invested in their success. The leadership team has skill gaps. If the company cannot justify hiring full-time employees, advisory boards can provide perspective it's not getting internally. The most common needs are in accounting or finance. The company plateaued or is in a rut. If a company feels too entrenched in a given set of processes and product offerings, it could benefit from an advisory board's fresh insights. This is especially impactful for companies that have hyper-political and entrenched cultures. Source and recruit. Don't hesitate to do cold outreach with candidates unfamiliar with the company. And, don't be overly concerned about waiting for the right moment. Only after engaging with multiple candidates should a decision be made. Make sure to thank the candidates who were not selected and let them know that you would like to stay in touch. Set key performance indicators. It is important to work towards milestones, measure outcomes against KPIs, and swap out members when they are no longer a fit. Don't be shy in executing evaluations—good advisors will want goals and to be held accountable. At its simplest, advisory boards are groups of subject matter experts that provide a company's leadership team with guidance on company vision, innovation, risk management, and profitability. Though they provide management with advice, they do not possess the authority to vote on corporate matters. In his 17 years of finance experience, Patrick has been an investor, board member, executive, banker, and entrepreneur (co-founded five businesses in finance, healthcare, and natural resource development). He joined Toptal to provide executive-level expertise between two board commitments. Patrick is highly visible in the business community and excels at using his network to provide executives with access to capital, clients, and partners.